The Dorchester Brewing Company celebrated its ribbon cutting ceremony with Mayor Martin Walsh and other city and state officials Wednesday morning, one day before the contract-brewery and taproom is set to have its grand opening and launch to the neighborhood. Co-founders Travis Lee, Todd Charbonneau, Matt Malloy, and Holly Irgens welcomed officials, investors, and members of the media into their soon-to-be-opened facility. The sprawling, 20-tap brewery is housed at 1250 Massachusetts Ave., easily discernable with its burnished and towering grain silo set off by the scripted “Dorchester” above the building’s facade. That two of the co-founders are long-time Dorchester residents is only part of the reason they decided to open up shop in the neighborhood, Lee said. As it starts out, DBCo is offering six house brews on tap: Clapp’s Cream Ale, V1 Double IPA, Mass Ave IPA, Savin Summer Stout, Minivan Hefe, and Nitro of the Day. A look at the menu and fresh pictures of the layout are populated through social media. Those six beers will soon have some hoppy, frothy company, though. It's a contract-brewery, which partners with small- and medium-sized brewers to use the 25,000-square-foot production facility to bring forth new beers from assembling ingredients through final distribution. Starting Thursday, the taproom will be open Wednesday to Saturday from 11:30 a.m. to 11 p.m. and Sunday from 11:30 a.m. to 9 p.m. Expect food trucks outside daily for weekday dinner and weekend lunches. 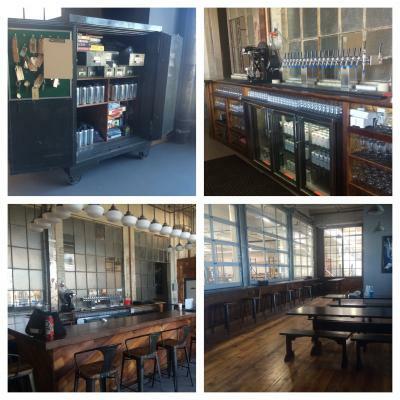 As August rolls in, DBCo will host brewery tours and offer fresh beer to go.